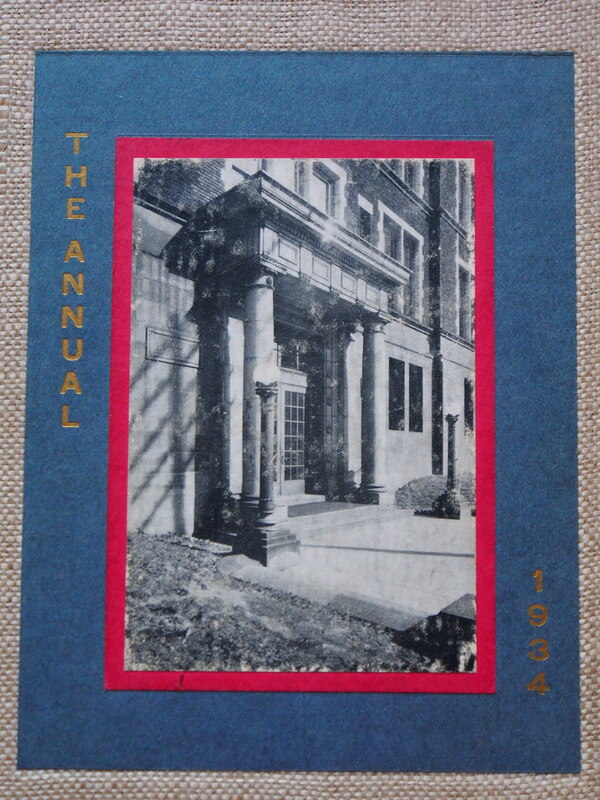 For me, that imminent closure is somewhat personal: my dad graduated from Wilkinsburg High in 1934. At the time, he wasn’t even living in the area: his dad had been transferred to Philadelphia, on the other side of the state, not long into my dad’s senior year. But my dad wanted to say he graduated from Wilkinsburg High, so he arranged to get his degree early and then traveled back across the state that spring, to graduate with his Wilkinsburg High class. When my dad died in 1991, I inherited his high school yearbook, with all the signatures and notes from his friends (and a typed list of graduation events from May 1934). I put it away and didn’t think much about it until 2013, when my DC family for the first time visited Pittsburgh. I wanted to see where my dad had grown up and gone to school–and for my kids to do so as well. I didn’t know what to expect exactly–both my dad’s parents died before I was born, as he had died before my kids were born, and I have no connection to either the area nor any other relatives from it. The only tangible items I have from my dad’s life there are his yearbook and pieces of inherited furniture. Perhaps as a result, I imagined his family’s life like mine here in DC, where that furniture has long been part of our life in our rowhouse. Turns out, my dad and his family lived in a bungalow on a small, neat street of bungalows with small yards and backyard garages. At the time, 1920 through 1934, those houses would have been relatively new and solidly middle class. It was a good location for my grandfather to get to his job (by car! from the garage he built!) as an engineer for Westinghouse, which had a large and modern facility nearby that employed thousands of people. When we visited, that Westinghouse facility was empty except for a few small workshops. It closed in the 1980s; a newspaper story from 1991 called the area around it a “ghost town,” which seemed an accurate description even in 2013. The bungalows themselves were no longer new and certainly not upscale by 21st century standards. And now, nearby Wilkinsburg High, with the grand façade of the great public institution it was created to be, is soon to be closed. Closing a school like Wilkinsburg High seems so logical: underenrolled schools cost more to run than fully enrolled schools, because you still have to pay for essential staff, but with fewer students to cover the same costs. And, for a school with low test scores, closing it means one less set of low test scores and the possibility of higher test scores for the same students at another school. But in DC at least, the money saved by school closures turned out not to be as much as originally estimated–despite the lawsuit decided on this point in favor of the most recent school closures. And what analysis has been done in DC or elsewhere to show that kids from closed schools with low test scores get higher test scores at other schools? And what analysis has been done on the costs to students and their families implicit in closing schools, especially with the high closure rates we have with charters here in DC? When schools have been closed here in DC for low enrollment or test scores, people have cried out. Right now, in DC at least, by right schools closed years ago are still stirring controversy, as the chancellor has indicated she is interested in potential expansion for DCPS–and the charter board has made clear that it wants them turned over immediately for new charter schools. But what is missing in most discussions of school closures is that grand façade of Wilkinsburg High, shown above. Because what it represents is not merely a school design of an earlier era, of which we have many examples here in DC public schools (Eastern High and Stuart-Hobson Middle, to name two just in my neighborhood alone). Rather, what Wilkinsburg High’s façade represents is a democratic promise–not merely that kids would receive a good education there, but that the school itself was an important civic institution whose grand architecture befitted its noble purpose. Talking about public schools as civic institutions is not often done now. We talk about test scores. Teacher evaluations. Student performance. Indeed, the testing company Pearson speaks about the “industry” of education. In the last two years, I have heard almost nothing about DC public schools as civic institutions, but plenty about how DC schools and their students are failing (no matter how ill-informed that critique is). Regardless of how one views the “performance” of schools, by right public schools like Wilkinsburg High are civic institutions. They are where we go to vote. They are where we have public meetings. They are where we take shelter in emergencies. And they have been historically located around all our homes because they are where we undertake the most difficult task and greatest promise of our democracy: educating all our kids, not just those lucky enough to score a good lottery number or lucky enough to have parents who can afford a certain house or neighborhood. That democratic promise has been threatened, has been made fun of, has been dismissed and dissed by all manner of things, including legalized segregation and de facto segregation, privatizing of public funds, and school closures that decimate neighborhoods and families. Despite those challenges, the promise of equitable public education for all has never left us. Like that grand façade of Wilkinsburg High, it is still there and still represents something great and good in all of us–well, provided we recognize it for exactly that. I like to think that my dad recognized it, when he went back to graduate from Wilkinsburg High in 1934 and then, 50 years later, when he returned to celebrate that fact. That recognition appears to be at an end for Wilkinsburg High. Do we recognize the same in our DC by right schools? Thanks for sharing this story about Wilkinsburg High and your dad. The fact that your dad went to the effort to graduate early and travel back for graduation speaks volumes about the school and the friends your dad made while he was there. You’re so right that schools are civic institutions. They are where so many parents get their first real experiences in the democratic process. This isn’t something that should be made fun of or dismissed. It’s at the heart of our democracy.